Media is shamelessly silent about SH and thus complicit. You can go to NY Times and search Sandy Hook hoax or discrepancies – and find nothing. There are so many discrepancies; people still have no idea. But I agree that actions and decisions near the school’s entrance were the most troubling. There’s not enough going on, mainly. 26 people shot? You’d expect a war zone. Cops to move in and take over – after all, who knows how many more shooters might be in there? Then other cops to do the CSI stuff. Then we’d expect a vast medical presence. Ambulances coming and going (but they are roped off by the fire house). 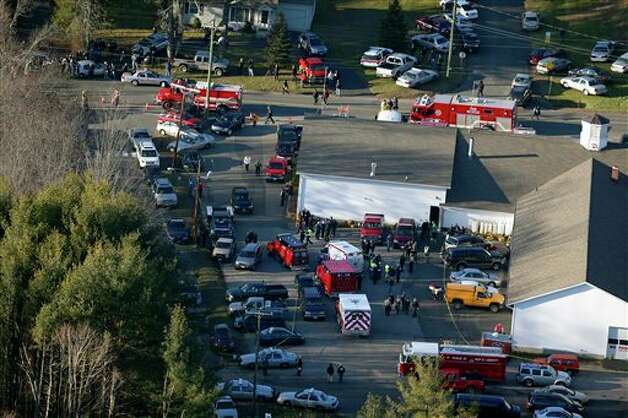 Newtown fire station near Sandy Hook Elementary School, December 14, 2012. 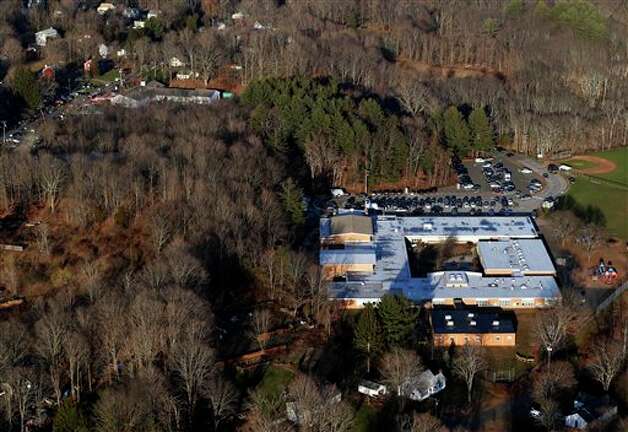 Sandy Hook Elementary School. Note the fire station in the upper left. 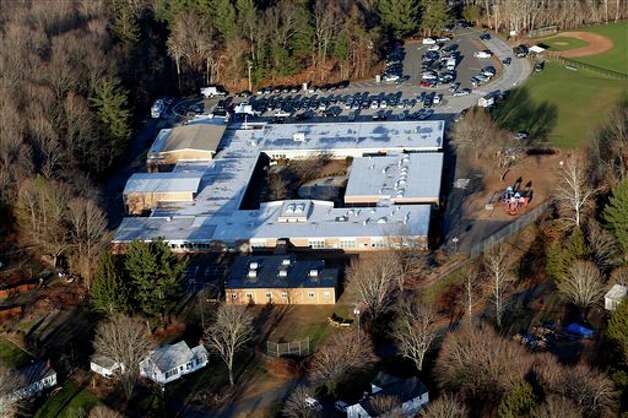 Closer view of Sandy Hook Elementary School. Note the absence of activity at any of the school’s entrances, though nothing about the photo confirms that it was taken shortly after the massacre. 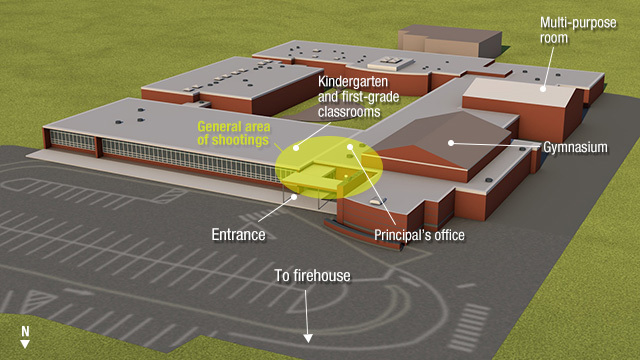 Diagram of Sandy Hook Elementary School to show key areas. Here’s an extended response to the comment above. You can see the shorter, original version here. Your comments are to the point. I didn’t know the acronym CSI, so I googled it: Crime Scene Investigation. I didn’t even watch the TV coverage, but I’m writing a book called Infamy that drew my interest to commentary on Sandy Hook. I think the term hoax in this case is unfortunate, even if it turns out to be true. That is, if twenty-six people died in the school, then a word like that cannot be helpful to victims’ families. I’m not referring to your use of the term, but the way the discussion has evolved on the Internet. Conspiracy theory isn’t so helpful, either. We need a new public vocabulary to talk about the breakdown of trust between government and media on the one side, and citizens on the other. As for the events in Newtown, we have to consider the possibilities: 1) the massacre happened the way the media portrayed it; 2) the massacre happened, but not the way the media portrayed it; 3) the massacre didn’t happen. In the latter case, one has to deal with a basic difficulty: it is hard to fake someone’s death. It’s much harder to fake twenty-six deaths in a widely publicized massacre. We are not talking about the pied piper of Hamelin here. Another consideration arises at the first suggestion the massacre was staged. If the parents who lost their children have the least suspicion their sons or daughters are still alive, they will raise holy hell to get their children back. If they did not lose their children in the first place, we would know it. At least I hope we would. Altogether, the likelihood that families in Newtown escaped grievous loss on December 14 seems small. Tom Sawyer may have attended his own funeral, but I’m not sure that could happen twenty-six times over in Newtown. Nevertheless, it is incredible to me that authorities kept twenty-six bodies in the school until three in the morning, then spirited them away under cover of darkness. Did parents actually acquiesce to such a thing? How much authority over families can policeman exercise in this situation? You want to show me a photograph, and prohibit me from holding my son or daughter before you cut into the body for an autopsy? From appearances, if your child is killed in a public school, the body becomes public property. So your comment about activity at Sandy Hook’s door vs. activity at the fire station is exactly right. Nowhere do we see the war zone atmosphere that ordinarily exists at much smaller crime scenes. Clearly, you can’t have ambulances at the scene if you plan to keep the bodies in the school. Astoundingly, virtually no one required emergency treatment, including students and staff who died of their gunshot wounds. Did medical examiners declare all the victims dead, right there in the classrooms and hallways? According to one account, the killer wounded only two people. Most accounts reported no one wounded. How could you fire hundreds of rounds in a school for nearly twenty minutes, and wound practically no one? Adam Lanza was not a Navy SEAL, nor was he a trained assassin. How was a troubled teenager, someone we have quickly assumed was mentally ill, able to act like a trained killer? Lastly, if you concentrate activity at the fire station, you distract from what is, and is not, happening at the school’s door. The media reports mention the fire station frequently. That seems to have been the center of activity after the massacre. It was close enough to the school to act as a reception and staging area, yet far enough away that people could not see what was actually happening at the school. If I’m an independent, investigative reporter, I don’t go where all the activity is. I grab a camera to take stills and video where everyone else is not. If someone that intrepid went to the school to take pictures of the front entrance from the parking lot, beyond the crime tape, can you estimate how many pictures you would take before police took your camera away? Post those photos to Facebook before you lose your iPhone and police haul you away. Bumbling reporters who just record what’s fed to them have become a staple of our news environment. Remember the well known video of news correspondents around five o’clock on 9/11, when they report that World Trade Center 7 has collapsed? The building stands in the background as the reporter speaks. About twenty minutes later, the building collapses in a controlled demolition. You figure if the media are going to participate in such incompetence, they would at least try to make themselves look a little less foolish. When you dance with government, you are going to look clumsy – clumsy, complicit, and corrupt. Here’s a closing observation: secrecy always undermines trust. Authorities may claim they want to protect the families in a case like Sandy Hook, but secrecy has the opposite result. It leaves the victims’ families part of swirling rumors about a hoax. They become part of a vast national conversation that floats around on doubt, skepticism, distrust and even contempt. Anderson Cooper calls the doubters “beyond crazy,” an expression of contempt in itself. The doubters respond as respectfully as they can, but the whole discussion goes nowhere. The Anderson Coopers and the doubters cannot talk to each other. What would openness require here? Release the school’s security videos. Schools do not have security cameras in the classrooms – not yet, I hope – so the video recordings would not show bloody murders. Release photographs of the killer’s point of entry to the school, with analysis of how the killer was able to defeat the school’s security system, installed that fall in time for the new school year. Release complete information about Adam and Nancy Lanza. Last and most important is the forensic evidence. Release the ballistics and autopsy reports as soon as possible. Watch down the line to see if these are ever released. If they are released, see how thoroughly the media report on their contents. Whatever happens, you will not see reports that contradict the media’s initial version of the massacre, or even reports that fill in key details of the initial version. At the end of a post like this, you find yourself thinking, what do they teach young people in journalism school these days? I wonder if the journalism schools will ever make a case study out of the Sandy Hook massacre. It’s title might be, What not to do at a crime scene. Students won’t see a case study like that for a long time. Training like that would make them care about the truth. Update: Check The Sandy Hook Massacre: Unanswered Questions and Missing Information, posted December 24, 2012, by James Tracy to his blog, Memory Hole: Reflections on Media and Politics. super article you got here, thank you for making it available! I do not realize who you might be however definitely you’re going to a well-known blogger if you are not already. your blog and may come back someday. I want to encourage you continue your great posts, have a nice holiday weekend! or newsletter service. Do you have any? Kindly allow me realize so that I may subscribe. can do with a few % to pressure the message home a little bit, however other than that, this is magnificent blog. thought :) I do have a few questions for you if it’s allright. by brain dead visitors? :-P And, if you are writing at additional online social sites, I’d like to follow everything fresh you have to post. Howdy! I just would like to give you a big thumbs up for your great info you have right here on this post. Yes! Finally someone writes about Body by Vi. the discussion. Usually it’s caused by the passion communicated in the post I browsed. And on this post News Coverage of Sandy Hook | The Jeffersonian. public sites like your linkedin profile, Facebook page or twitter feed? Nice post. I was checking constantly this bpog and I’m inspired! Extremely useful infoo specially the final phase :) I handle such nfo a lot. hello!,I love your writing so a lot! share we communicate more approximately your article on AOL?